The phrase “critical thinking” permeates job postings. In fact, the number of times “critical thinking” has appeared in job ads has doubled since 2009. But employers are complaining that colleges are not producing graduates who possess the skill. The reasons? Richard Arum, a New York University professor and co-author of Academically Adrift, claims colleges are requiring less academic rigor of their students. Add to that the steady decrease in the number of hours students devote to studying as well as the fact that many graduate without ever having to write papers that require in-depth thinking combine to create poor critical thinking skills. The upshot is that hiring managers say that nearly half of the graduates they see can memorize and spit back information but cannot connect the dots between what they have learned and its application in the workplace. The half who can make those leaps have a hard time illustrating their abilities to future employers. That’s because critical thinking looks different to individual employers, says Linda Elder, educational psychologist and president of the Foundation for Critical Thinking. She explains that an entry-level job posting may include the omnipresent “must possess critical thinking skills.” However, in many lower-echelon jobs, bosses may not be looking for challengers of the status quo, a typical characteristic of critical thinkers. At other organizations, however, even entry-level hires are expected to recommend changes. Because employers define critical thinking differently, it can be hard for new hires to show that they can do it. So just how can new graduates present their critical thinking abilities to a future employer? Experts say when interviewing, candidates should relate stories that describe specifics about their ability to analyze a problem, determine the accuracy of information, use judgment to make decisions, and draw conclusions, all part of the definition of critical thinking. Such illustrations may come from a student’s involvement in club activities or even from a part-time job. New graduates should likewise be prepared to answer open-ended prompts such as “Talk about how you handled a difficult situation.” This type of question is designed to help employers assess a candidate’s critical thinking skills early in the interview process. In late-round sessions, candidates may be asked to actually apply those skills to a particular business problem. Goldman Sachs, for example, asks its sales candidates to assess a company stock pitch and explain the process by which they came to their conclusions. In the end, employers’ definitions of critical thinking may vary—but their desire for workers with the ability remains remarkably consistent. How do you help mold critical thinkers in your classroom? Share your experiences! This entry was posted in 2. 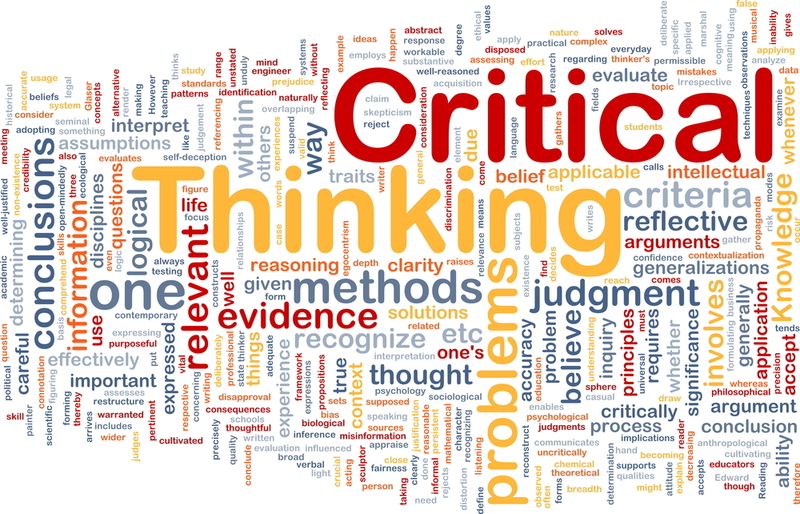 Featured Articles and tagged critical thinkers, Critical thinking, critical thinking skills on December 29, 2014 by bizcombuzz.